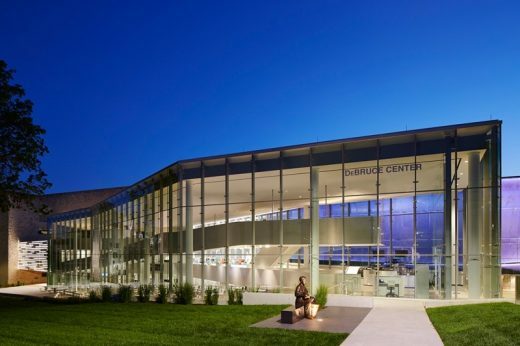 The DeBruce Center at the University of Kansas is a unique hybrid of museum and student commons designed to serve as the permanent home for the historic two-page document on which, in 1891, James Naismith outlined The Original 13 Rules of Basketball. KU alumnus David Booth purchased this historical document at auction for $4.3 million and subsequently donated it to the university. For the university, obtaining The Rules – the “holy grail” for basketball fans – cemented its identity as the cradle of the sport. Naismith had founded KU’s acclaimed program in 1898 and then spent nine years as its coach. However, the acquisition was contingent on building a facility suitable to house and display it. With the donation of a lead gift for the building, the project became a reality. Initially without a program – aside from the protection and display of two sheets of paper – the architects and university stakeholders came together to outline three guiding principles for the project: to create an economically-sustainable facility, honor The Rules while expanding the narrative to illustrate how they have evolved into the contemporary game, and to serve the university community throughout the academic year, not only on game days. 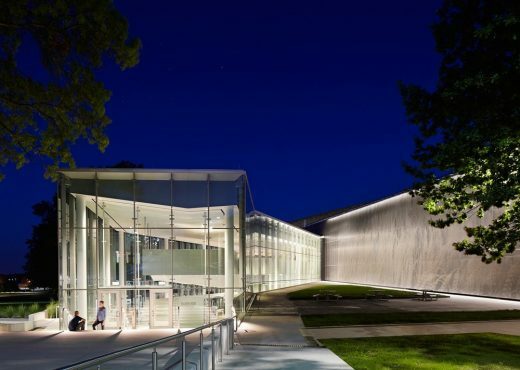 Guided by these principles, the architects wove together two distinct programs – student commons and interpretive center – overlapping them to take visitors on a journey through the history of basketball. 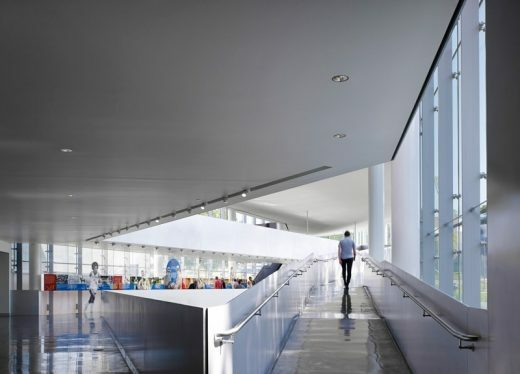 A linear pathway winds through the open interior of the prismatic glass volume to integrate The Rules and other exhibits with a 200-seat dining commons for students and visitors, nutrition center for the men’s and women’s basketball teams, coffee shop, museum store and meeting spaces. A single-story bridge leads visitors into the adjacent Allen Fieldhouse, where Naismith perfected the game of basketball. Within this bridge, the original 451-word document is enshrined by a perforated scrim containing the more than 45,000 words that make up the contemporary rules of the game, offering visitors a way to physically experience basketball’s evolution over 125 years. 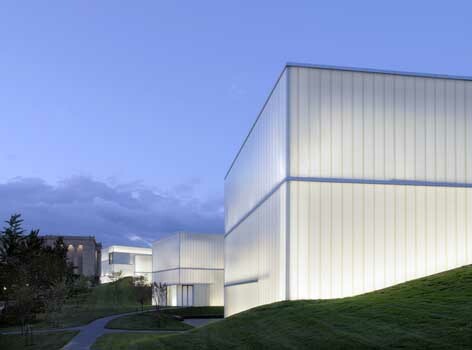 The architecture breaks with the sports museum conventions of bright colors and bold logos in favor of a more sophisticated building form and a lighter, more reductive materials palette of structural glass, honed black concrete and aluminum. 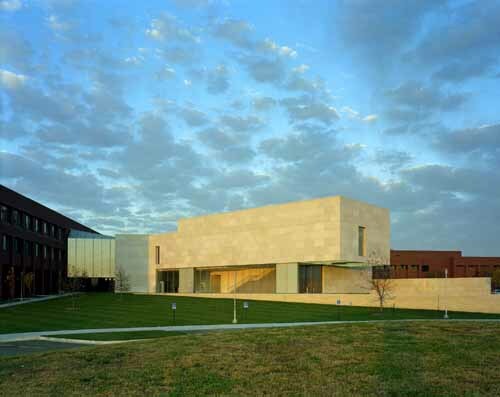 This allows the building to remain deferential to the fieldhouse during the day and gives it more versatility of use. 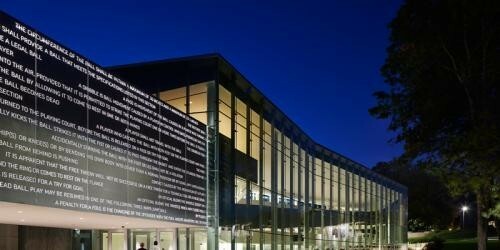 At night, the building is silhouetted against a front-illuminated metal scrim, revealing its program and occupants to the broader community. 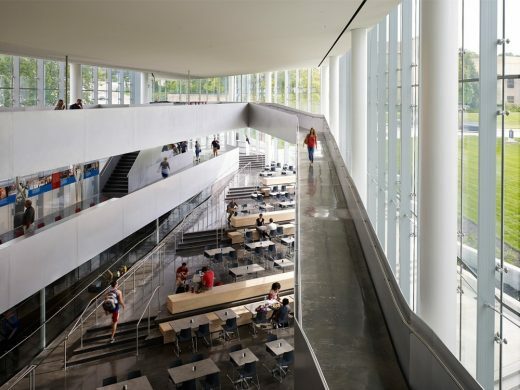 The transparency of the volume highlights the color and circulation of the inhabitants along the ramps – whether students, game-day crowds or groups of basketball history buffs. This spectacle of social activity breathes life into what might otherwise be a very traditional museum experience. The space formed between the building and scrim creates a new “pocket park” where students can gather and basketball fans can enjoy pre-game activities. Structural Engineers: Bob D. Campbell & Co.